BobCAD-CAM, a world leader in powerful and affordable CAD-CAM software, is waiving the fee for Machinist ToolBox (normally retailing at $100.00) whenever anyone downloads a trial of our latest CAD-CAM software. Machinist ToolBox offers fast access to optimized speed and feed calculations for CNC milling, drilling, turning, and tapping, in addition to trig calculators, quick conversion formulas, and important reference guides. These calculators are specifically designed for CNC machinists and can be applied to any number of CNC programming jobs. 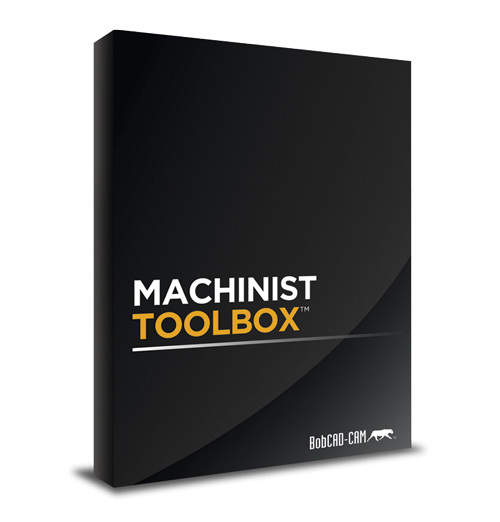 One of the most powerful features within the Machinist ToolBox is the extensive material feed and speed calculator that comes with a pre-configured material library, including data on aluminum, alloy steels, carbon steels, tool steels, stainless, cast iron, copper, titanium, superalloys, plastics, and much more. It even has a place to input user-defined materials using custom set speed and feed data. For over 30 years, BobCAD-CAM has been dedicated to designing powerful, user-friendly and affordable CAD-CAM software. BobCAD-CAM products are used in CNC machine shops and schools all over the world – helping to automate the programming process for mill, mill turn, lathe, router, plasma, laser, waterjet, and wire EDM CNC machines. The company also provides solutions for CAD, artistic CAD, nesting, solid machine simulation, custom g-code post processors, comprehensive training, and support packages. BobCAD-CAM, a world leader in powerful and affordable CAD-CAM software, has launched a new website, www.Machinist-ToolBox.com, where CNC machinists can download the popular shop utility, Machinist ToolBox software, at no cost.